Pen and ink drawing of the east wing of Government House in Calcutta by Lady Sarah Elizabeth Amherst (1801-1876) dated 1824. Lady Sarah accompanied her father Lord Amherst to India on his appointment to Governor-General in 1823. Marquess Wellesley, a previous Governor-General, had commissioned the construction of the new Government House in 1798. The architect, Captain Charles Wyatt of the Bengal Engineers, based his designs for the new building on Kedleston Hall in Derbyshire. 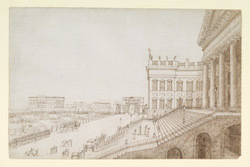 Describing the building Lady Sarah wrote, "View of the east wing in which is the Council chamber, part of the portico and the great steps, and the archway under the portico, where carriages set down, copied from a drawing done by Edward from his window facing the Council room, the figures added by myself. It is not customary for any one to go down the great steps but the Governor General and his family, and this is supposed to be evening, when his Lordship and her Ladyship, the first ADC and Mily. Secy. with your humble friend the artist, attended by the two ADC's in waiting, are going to take the air. His Lordship's and her Ladyship's two head servants, the Nazer and Jamadar are following them, and the rest of the Swarry or retinue, who have preceded them carrying silver sticks and clubs, have arranged themselves on the steps for them to pass between down to the carriage. The Buggy behind is for the ADC's. A small detachment of the Body Guard is drawn up and carrying arms, two troopers precede the carriage and the rest follow. The footguard are presenting arms, and the drummer and fifer playing a wretched imitation of the Grenadier's March, with which they salute our ears whenever we go out or return home and generally frighten some of the horses, as you will see pourtrayed. The area before the house is quite filled at airing time with buggies and horses, but I have only inserted a few to avoid confusion, it is the custom to have all the vehicles and horses in readiness that their masters may take their choice. When we are fairly underweigh and through the gateway, which is in sight, we turn to the right and to go to the Course, but for a view of what is to be seen there, I must refer you to a little sketch I sent Maria. The large birds on the top of the house are called Adjutants, most huge clumsy creatures, but rather ornamental than not to Govt. House as they arrange themselves like statues at regular distances on the balustrade and on the most conspicuous points of the building and remain motionless for hours, in a musing posture. They have a long bag which they can contract or dilate at pleasure, but they do not use it for provisions or any particular purpose. They are so useful as scavengers that there is a fine for killing them, however in the Fort where they abound, the young Cadets play them sad tricks, such as throwing out a leg of mutton tied to a large stone, so that when the Adjutant has gobbled it up, he finds himself anchored - putting out meat smeared all over with mustard and pepper - and there is a story in the house that to satisfy Lord Hasting's own eyes, a calf's leg with an iron shoe on the hoof was thrown out and immediately swallowed whole by an Adjutant, they are so greedy - The buildings outside the iron railings are part of the town of Calcutta, the large house is a great warehouse and shop, and to the left of it, is the end of a low range, which are the godowns or offices of Govt. House, the cook house etc, marked in the plan." Among the individuals mentioned in the notes are Jeffery Amherst, HM 59th Foot (1802-26), eldest son of Lord Amherst and Military Secretary and ADC to his father; Edward Hale, private secretary to Lord Amherst; Clark Abel, his physician and surgeon.